This report for the July UPDATED ‘FACTS’ from the Washoe County Assessor Records since last posted for June, 2017, in An ArrowCreek Property Value Update (June 2017 from Washoe County Assessor Records), shows that we have entered an exceptional buying/selling season, with twelve properties changing owners during this reporting period. In fact, for the very first time that these facts have been tracked over the past two years, custom homes on the Golf Course sold for a 20% premium to those not on the course! Whether this is an aberration of short term data or the beginning of a long-term trend, it certainly gathers one’s attention. 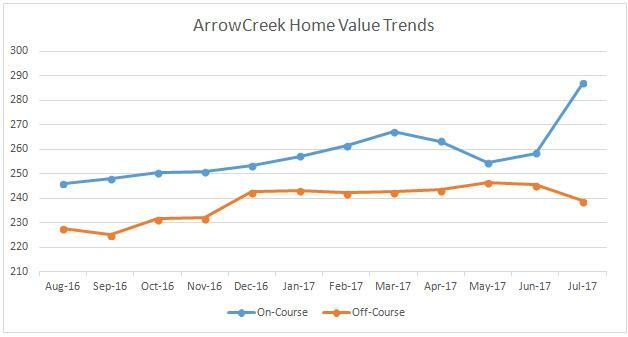 ArrowCreek Home Owner Association (ACHOA) initiatives are underway to enhance sales and values (a most positive step given the latest values). The initiatives include a Landscape Committee, which is looking into improving the water quality around our parkway to enhance the ‘greening’ of plantings, a strategic planning initiative, which has yielded a preliminary concept that has received rave reviews from those who’ve seen it, and an update of the Governing Documents, drafts of which have been issued for owner comments and questions. These initiatives are intended to enhance and maintain ArrowCreek as a premier people and family oriented community. 1. ArrowCreek properties have stayed in the premium class within Washoe and Douglas Counties. As you read this report you will see that prices have improved for properties on the golf course, with an average appreciation rate of a market leading 16.6% over this past year, while prices for homes not on the golf course have also trended upward with an increase of 4.9% over the same period, with the ‘hottest’ neighborhoods this month being Granite Point I, Indigo Run, and Desert Canyon. a.) Twelve (12) properties were recorded sold in ArrowCreek between 20 June and 13 July 2017 (Per the Washoe County Assessor, who appears to be running late as the data was extracted on 24 July and the last ‘sale’ recorded was 13 July). This brings the total number of properties transferred over the past year to 86 or 7.9% turn-over rate for our community. A relatively low rate, still in the single digits, that may be attributed to a general satisfaction with living in our gated community or a positive perspective on our amenities and an emphasis on the secure stable environment offered within ArrowCreek. b.) Seven (7) of the properties were on the golf course (where the property boundaries actually touch the golf course, not just have a ‘view’ of it). The rolling average selling price for homes on the golf course now stands at $287.08 per square foot. An increase of $28.56 per square foot from June’s value. The 12-month rolling average sales price increased to $1,096,314.48. No additional lots, on the course, were sold. The rolling average selling price for undeveloped property on the golf course stood at $189,136.12 per acre due to the statistical rolling year average. c.) Five (5) properties were sold that are not connected to the golf course. The rolling average selling price for off course homes decreased to $239.01 per square foot, which is down by $6.60 per square foot. The twelve-month rolling average sales price decreased to $780,362.96. No additional lots were sold during this reporting period. The rolling 12-month average selling price for vacant land, not on the golf course, now stands at $219,590.64 per acre due to the statistical rolling year average. d.) The figure below shows the value trends over the past twelve months. Our homes and properties have appreciated very nicely over this past year and that trend continues. The left axis was shifted due to the huge increase experienced by the average value increase on ‘golf course’ homes. 2. The housing market in Northern Nevada for existing homes continues to follow economic trends. The summer selling season is upon us and we are seeing a boost to our unique community. Great compilation Ron. Thanks for the effort. It comports with what the Real Estate Agents that sell in ArrowCreek are stating as well. However, the market will dictate the price and if the home is not maintained, it will be sold at a lower price.